As expected, the Democrats’ constitutional amendment to change the way Illinois draws its voting districts failed today. House Republicans and one Democrat voted down the measure after about two hours of debate this afternoon. Republicans were critical of the plan because under it, a simple majority could pass a map for both chambers, giving the majority party the power to cut out the minority. “It gives an edge to the majority party. That’s not the way redistricting should be. It should be a level playing field … and it should not be about us taking care of our own districts. These are not ‘our’ districts,” House Minority Leader Tom Cross said after the vote. Republicans said the plan was set up to fail so the current system would stay in place. “No one really thought that was real. It was another attempt, in this state, of reform that really wasn’t reform,” Cross said. He added that Gov. Pat Quinn’s criticism of the measure earlier today only backed up his theory. Democrats and Republicans alike are critical of the current system, which often ends in a random drawing to decide which party gets to create the map. Democrats said their proposal is the one that made it through the legislative process and accused Republicans of casting their votes in favor of the current system. Public employee evaluations would be sealed to the public if Gov. Pat Quinn signs a measure that opponents say would roll back major reforms made last year in the state’s Freedom of Information Act (FOIA). The change would expand an exemption that Quinn signed into law earlier this year exempting performance evaluations of teachers, principals and superintendents. The new changes are part of legislation meant to improve Illinois’ chances at earning federal education grant funding. Proponents argued that opening up the evaluations to the public would devalue them, as those writing the evaluations might be less candid, and that treating educators differently from other state employees would not be fair. Opponents call the measure a step back in Illinois’ progress toward a more open government and worry lawmakers will further degrade last year’s FOIA reforms. “We are concerned that more bills will come down the pike to further shove public information into the shadows,” said Melissa Hahn, president of the Illinois News Broadcasters Association. Although Lightford has said there’s no connection between the union-backed FOIA change and recent changes to the state’s pension systems, which unions adamantly opposed, Hahn said she’s not convinced. “The unions lost when it came to pensions, so lawmakers are giving them this to help make up for it,” Hahn said. The pension legislation went through both houses in one day on March 24, about a year after Quinn first proposed the measure. The House approved the FOIA changes on March 11 , and the Senate approved the measure today. Illinois House members say they will not vote on the Democrats' redistricting plan until tomorrow. House Speaker Michael Madigan and Chicago Democratic Rep. Barbara Flynn Currie had said yesterday that the constitutional amendment would be called for a vote today. But legislators left the Statehouse this evening without considering the measure. Democrat Sen. Kwame Raoul, the Senate sponsor of the plan, said it was bumped to tomorrow because some Democrats were not in Springfield today to cast their votes. "I'm hopeful. I'm hopeful. You never know what's going to happen, even on this side of the aisle," Raoul said. He was on the House floor today lobbying members of his party. "I'm not talking to people about the weather. I'm answering as many questions as I can." Raoul said he thinks some Republicans may vote for the amendment when they realize the choice is either it or the status quo. However, many Republicans still insist they cannot support a proposal that would allow legislators to draw voting district lines. Mary Kay Betz, a director at the Autism Society of Illinois, was once told that her son Riley would never speak. Today, he read a speech in front of lawmakers, advocates and reporters as he worked to encourage awareness during Autism Lobby Day. “If I hadn’t received the services I did at the time, my life would probably be very different,” 9-year-old Riley Betz said. “Because the programs were funded when I was smaller, I was given a chance.” But he also pointed to the state’s current financial climate is leading to providers no longer receiving timely paychecks and cuts to services. All the while, autism rates are rising. The challenge going forward, Bellock said, would be to ensure that autistic children still have support when they become adults. She said the state needed to start exploring ways to make that happen. “Between insurance coverage, between educational programs, early intervention programs, early diagnosis, these are all key to making this condition a livable condition,” said Elmhurst Mayor Pete DiCianni, whose daughter is autistic. While he doesn’t expect any further action until after the election, DiCianni is helping push Senate Bill 3106, which would allow voters to remove limits on property taxes for special education. Lawmakers also called for constituents to voice their concerns to their representatives and senators, including the four legislative leaders. Illinois’ next legislative district map could be determined by the luck of the draw, yet again. With a Democratic redistricting plan struggling to find the Republican support it needs, and a voter initiative falling short on signatures, it looks as though the current system may stay in place. A House committee voted down the “Fair Map” constitutional amendment backed by Republicans and several reform groups, including the League of Women Voters. The committee approved the Democrats’ “Citizens’ First Amendment,” which passed in the Senate over heated protest from Republicans. After the Republican plan was shot down in a Senate committee, Senate Minority Leader Christine Radogno, the sponsor of the amendment, said she would be willing to add more protection for minority populations. That was a major area of criticism from Democrats, and some supporters of “Fair Map” say it could be stronger on this point. Radogno added that she thought concerns over diversity representation were not the real reason for Democratic opposition. She said Democrats' true worry was the legislature losing its map-drawing power. Yet the Republicans did not call what they perceived as the Democrats’ bluff today. The amendment they presented was identical to the one that stalled in the Senate, and many Democrats said their desires to protect minority voters played into their “no” votes. “The question is, why do you not enhance the ability for communities of interest and minorities … to have their seat at the table,” said Rep. Lou Lang, a Democrat from Skokie. The biggest sticking point between the two plans is ultimately who draws the map. Republicans say that the legislature cannot draw the districts they will be elected from because it is a conflict of interest. They want a commission appointed by the legislative leaders to create the map. The amendment now goes to the House floor, where,if it receives the backing of every Democrat, it will still need at least one Republican vote. None of them are stepping forward to voice support at this point. In fact some are saying the plan was set up by Democrats just to be knocked down. “Democrats will not compromise. And this is all nice window dressing that they’re going through right now, but the fact is at the end of the day, they’re not going to take our suggestions to heart. They will not make any changes. They want this to fail. The want the status quo,” said Rep. Jim Durkin, a Western Springs Republican. The U.S. Supreme Court will not reopen a nearly 100-year-old lawsuit, as requested by Michigan Attorney General Mike Cox, who sought closure of Chicago navigational locks as a way to keep Asian carp out of the Great Lakes. Illinois Attorney General Lisa Madigan said in a written statement today that she was pleased with the court’s decision and that Illinois will continue to work with other states and the federal government to combat Asian carp. Cox continues to urge President Barack Obama and Congress to push for immediate action, and Cox’s office said it would now review whether to take the case to federal district court. In initial filings with the U.S. Supreme Court, Illinois argued that the case did not belong in the highest court but in federal district court because it was not a state versus state issue. The locks Michigan sought to close are controlled by the U.S. Army Corps of Engineers. Supreme Court Justices declined to hear Michigan’s lawsuit but did not offer reasons for denying it. They previously denied two requests from Michigan for immediate closure of the locks. The Republican candidate for governor, state Sen. Bill Brady, made his tax returns availed to reporters for three hours today. He paid no federal or state taxes in 2008 and no federal tax in 2009. He paid $3,309 in state taxes last year. Brady took advantage of a 2009 federal provision geared at helping small businesses make it through the recession by allowing the sale of assets. In 2004, Brady’s gross income was more than $550,000. He suffered a loss of more than $115,000 in 2008, and last year, his gross income was almost $120,000. Brady’s construction and realty businesses have taken a hit during the recession and collapse of the housing market. According to a news release issued by the campaign, tough financial times resulted in employee layoffs and downsizing. "One of the reasons I'm running for governor is so that others don't have to face the anguish of job loss and dislocation that too many in our family company have," Brady said in the release. "I've seen the harsh effects of the old politics in real lives, and I know what a pro-growth environment can mean for workers." Gov. Pat Quinn publicly called for Brady to release his returns earlier this week after releasing his own. Quinn’s gross income for last year was more than $150,000. He paid $27,547 in federal taxes and $4,468 in state taxes. Brady said he decided to let reporters view his tax returns to keep the issue from becoming a “distraction” in the campaign. Republicans said today that Gov. Pat Quinn is exaggerating his budget cuts, and his plan relies too heavily on taxes and borrowing. “The governor came out and wants to convince people that he heard the people of this state when they said they want government to rein in spending. He is trying to convince people he’s going to cut $2.6 billion, when it’s clear that at best, he’s got $200 million up there in unspecified cuts [if his proposed 1 percentage point tax increase passes], and this is from a guy who’s got a track record of claiming he is going to cut and not having the guts to go ahead and do it,” he said. However, Kelly Kraft, spokeswoman for Quinn’s Office of Management and Budget, said if the governor’s proposed income tax increase passes, there would still be $900 million in cuts. She added that Quinn is seeking to make $400 million more in reductions, in addition to the cuts he proposed in March. Republicans are calling for more substantial cuts before they would even consider a tax increase. “Because we do, in the end, have to be specific with this. I would think that a number that would cause movement [on the governor’s budget] over in the House would be in the range between $2 billion and $3 billion,” said Sen. Chris Lauzen, an Aurora Republican. Lauzen said those cuts could be achieved through Medicaid reform and changes to pension benefits for current employees. He also said that Illinois needs to lobby Washington, D.C., for more flexibility in spending stimulus money. Quinn and Sen. President John Cullerton have both said that changes to pension plans for those who already work for the state would be unconstitutional. Quinn proposed $4 billion in borrowing as part of the plan he unveiled last month. Republican leaders are asking for a list of the cuts Quinn says he has made to the current fiscal year’s budget. Kraft said her office will give Republicans those numbers in the next few days. Sen. Dave Syverson, a Rockford Republican, is optimistic about Illinois making a financial recovery, but he says it will take time. “If we address the spending first and then we work on a plan to start paying off that debt by growing our economy, we can get through this. We just can’t get through it by continuing to spend at high levels and continuing to borrow and raise taxes. We can get through this, and we don’t have to do it overnight,” he said. Parents of children in failing Chicago public grade schools may soon have the option to send their kids to private schools. Senate Bill 2494, which advanced through a House committee today, would create a pilot program that would allow students in the 10 percent lowest-performing grade schools, as measured by No Child Left Behind Standards, to take state dollars to pay tuition at private schools in the city. “I think it is the right thing to do for the right students at the right time. We need to give them an opportunity to have some success in life. These students that would be eligible for this program don’t have much of a chance in the existing schools that they’re at,” said Chicago Democratic Rep. Kevin Joyce, House sponsor of the bill. Jim Reed, director of government relations for the Illinois Education Association, said pilot programs similar to the one proposed in this bill were not successful in other parts of the country. Reed added that the measure would “divert much-needed resources from public education. The bill has already passed in the Senate with bipartisan support. Concerned citizens would no longer have access to any portion of any public employee performance evaluations, under a measure that moved through a Senate committee today. Earlier this year, evaluations for teachers, principal sand superintendents became exempt from disclosure under the Freedom of Information Act as legislators worked to gain enough support for Race to the Top legislation, which ties student growth to educators’ evaluations. The latest legislation, HB 5154, stems from related negotiations and would expand the exemption to all public employee evaluations. Itasca Republican Sen. Carole Pankau, who opposes the measure, said that evaluation results, a final rating or grade for instance, should become public information. “I think that’s a reasonable request,” Pankau said. “I think verifying employment is fair, but to go into great details, I think that’s a little unfair,” said the bill’s sponsor, Sen. Kimberly Lightford, a Maywood Democrat. Those who successfully pushed FOIA reforms last year in SB 189 say the new measure would unravel those efforts. “It shoots a major hole in one of the reforms that we had badly wanted,” said Beth Bennett, government relations director with the Illinois Press Association. Last year, the association had worked to make the results of performance evaluations available for public scrutiny. Personal information such as medical concerns and Social Security numbers remained exempt, Bennett said. The Illinois attorney general’s office, which pushed for last year’s reforms, agreed the new legislation weakens the FOIA law. Regardless of financial need, all seniors are likely to continue getting free mass transit rides. A Senate committee on Wednesday voted against HB 4654, which would have repealed a program instituted by then-Gov. Rod Blagojevich that allowed higher income seniors to ride buses and trains for free. Previously, higher income seniors paid half-fare, and only low-income seniors were allowed to ride free of charge. Lemont Republican Sen. Christine Radogno sponsored the measure and said that limiting free rides to just low-income seniors should be an easy decision for lawmakers during a budget crisis. The House earlier this spring approved the measure, which now remains in the Senate executive committee. Students remaining in college beyond the traditional four years could see locked-in tuition rates, under a Truth-in-Tuition measure passed by a House committee today. The Senate has already approved the legislation. The measure would limit fifth- and sixth-year college students’ tuition to that charged during their second year to incoming freshmen. At present, state universities can only hike tuition for incoming freshmen and for anyone staying in school beyond four years. Sophomores, juniors and seniors continue to pay the same amount they did in their first year. Rep. Daniel Burke, a Chicago Democrat, said SB 3222 is aimed at helping minority students – many of whom, as first generation college students, must take additional courses to catch up with their peers – afford the additional semesters needed to complete their degrees. University of Illinois Chicago senior Sean Murray told lawmakers the extension was necessary because state budget cuts have lead to fewer faculty members and more difficulty for students trying to enroll in required courses, meaning they end up staying in school longer. But Rep. Mike Bost, a Murphysboro Republican, said Truth-in-Tuition as it is now creates enough problems – compounded by a lack of state funding – without extending it. “What ends up happening is, the incoming freshmen quite often have to have a higher increase to make up for where we’re short falling for the seniors who are locked,” Bost said. “To extend it on to six [years] is once again pulling the rug out from underneath our institutions.” He added that the new legislation wouldn’t just be available to those with special needs but also to those who are just plain lazy. Rep. Richard Myers, a Colchester Republican, said individual universities should be allowed to determine best practices for graduating students in a timely and cost-effective manner. “I think you are trying to apply a broad general application to universities that are very, very different,” he said. Some universities say they already go above and beyond existing Truth-in-Tuition rules, including Northern Illinois University, which locks in tuition for nine semesters, and Western Illinois University, which has a guaranteed four-year completion plan and applies the existing Truth-in-Tuition law to room and board. Both institutions oppose the new legislation. “It’s a matter of one size doesn’t fit all,” said David Steelman, director of government relations at Western. Citizens advocating for an income tax increase to avoid deep cuts to the state budget packed the Illinois Capitol today for one of the largest rallies in recent history. The secretary of state’s office estimated that 12,000 people participated in the march and 15,000 total were in the Capitol complex as part of the rally. With chants of “We’ll remember in November” and “Save our schools. 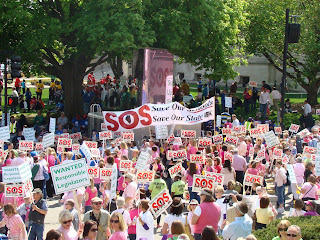 Save our state,” protesters marched around the Statehouse and then filled the halls. They came to advocate for education and social services, such as mental health care, addiction counseling and in-home care for the elderly. “We have tens of thousands of people whose well-being is at stake if this state does not act. So I’m here to advocate for responsible decisions, a tax increase to support social services in this state, and I’m happy to join these thousands and thousands of people who have come out here to do this,” said Rev. Bob Rasmus, board member for Lutheran Social Services and a pastor in Urbana. Jo Ann Woods-Payne from ABJ Community Services on the southeast side of Chicago said she came out today to support HB 174 so her organization can continue to provide programs such as foster care, job training for public aid recipients and a clothing and food pantry. She said the state is behind on its payments to ABJ for the social services it offers in the community. “We feel possibly that the income tax needs to be raised if that’s what it’s going to take to help keep those programs open for our clients,” she said. However, Republicans in both chambers do not seem any closer to supporting a tax increase. “I like having [the rally participants] come here because there is not better way for me to explain my position on what’s going in this building and the way I think this state works its way out of its fiscal mess than to talk one-on-one individually with those people,” said Sen. Dale Righter, a Mattoon Republican. Righter voted against HB 174 last year and said he will not consider a tax increase until there are cuts and reforms to Medicaid, which he says is growing in an unsustainable way. Righter said that he doesn’t think the rally will change the minds of many legislators who are opposed to a tax increase. He also doesn't think Democrats are willing to take the political risk to pass a tax increase before the November general elections. 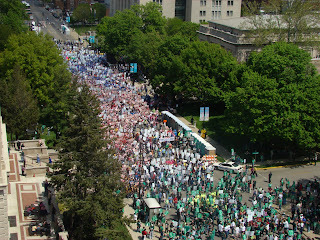 The day before thousands of citizens descend on the Capitol to call for an income tax increase, Gov. Pat Quinn met with legislative leaders to talk about the budget for the first time since he laid out his plan in March. 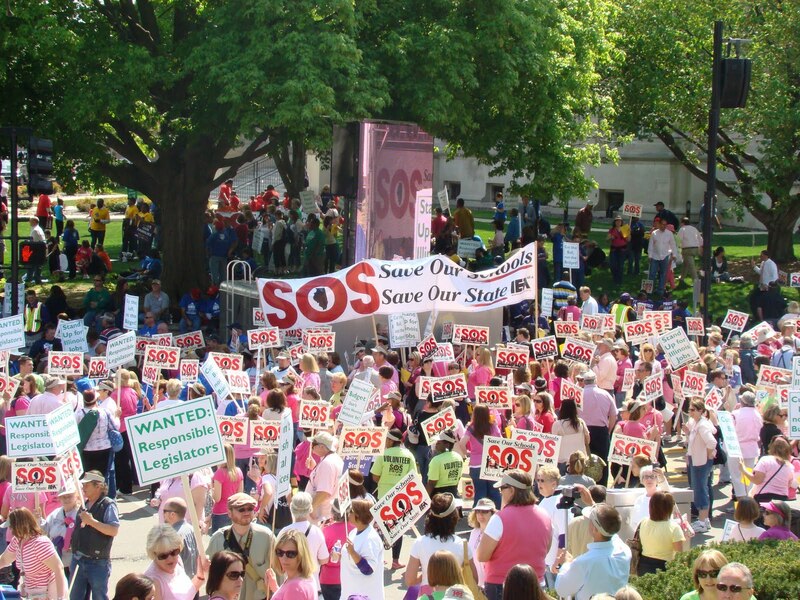 The Responsible Budget Coalition, made up of educators, union members, social services providers, religious organizations and others, estimates that more than 14,000 people will attend the rally it is holding tomorrow in Springfield. If that happens, it would be one of the biggest rallies at the Capitol in recent history — perhaps three times as large as last year’s rally when social service providers and unions packed the building to capacity advocating a tax increase. However there is no talk of calling HB 174, which passed in the Senate last year, for a vote in the House this session. There also seems to be little hope for Quinn’s 1 percentage point income tax increase, which he says is needed to avoid $ 1.3 billion in education cuts, passing before the November election. Both House Minority Leader Tom Cross and Senate Minority Leader Christine Radogno said the meeting lacked specific details. “The focus continues to be on borrowing and increasing taxes and very little focus on cutting. One of the questions we asked again, and we’ve asked for this a number of times, is specifically what cuts have been made. There’s been a lot of talk about potential cuts, and a lot of those things just haven’t happened,” Radogno said. As the budget is being sorted out there is talk of extending the lapse spending period, the amount of time after a fiscal year ends that the state has to pay off any leftover debts. The current lapse period, with an August 31 deadline, gives the state two months to catch up on late bills. The change would allow the state to legally push off paying its pile of overdue bills to schools, social service providers and vendors. Quinn’s budget director David Vaught said it would keep those owed money from having to go though the Court of Claims to get their money Illinois after the end of the lapse period. “I think there’s a recognition that we’re way behind. And it does not make sense to send our really involuntary creditors — these are people that loaned us money that didn’t sign up to loan us money. They signed up to deliver a service — to send them to the Court of Claims after they’ve been patient … and have been waiting on their money. I think would be a major problem. I think there’s a recognition of that. … I think there’s an understanding that we have to do something,” he said. Thousands of those owed money or directly affected by the backlog of bills will be coming to the Capitol tomorrow to make their case for a tax increase. “Tomorrow’s rally will show there’s a lot of people in Illinois, a great majority, that don’t want draconian cuts in education,” Quinn said of tomorrow's rally. Almost two thirds of Illinois residents returned the 2010 U.S. census forms they received in the mail. “We are off to a good start. Seventy-three percent is a good start, but we have a long way to go,” Gov. Pat Quinn said. The national response rate is 71 percent. Census workers will visit households of people who failed to mail back their forms before the April 16 deadline. Gov. Quinn encouraged citizens to respond to the surveys those workers will be conducting. “We wish and hope that everyone in Illinois will be cooperative and helpful because this is a very important financial issue for the people of our state. For folks who depend on education funding, and health care funding, human service funding and public safety funding, all the important things in life. 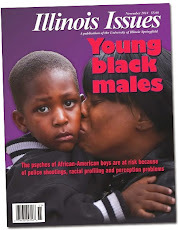 We want to make sure that Illinois has an accurate count of everyone who lives here,” he said. The federal government uses information gathered in the census, which is required in the U.S. Constitution, to dole out more than $400 billion in funds to state and local governments. The count also determines how many seats each state holds in the U.S. House of Representatives. Illinois lost a seat after the 2000 census and is in danger of losing another after this one. Individual information collected by census workers is confidential for 72 years, after which it can be publicly released. Advocacy groups need to collect more signatures from voters to get a redistricting plan on the ballot in November. An effort to put a constitutional amendment before voters in the general election, spearheaded by the League of Women Voters, has collected fewer than half of the signatures needed to get the proposal on the ballot. The league needs 288,000 people to sign petitions, and so far, Jan Czarnik, its executive director, estimates it has collected about 120,000. The signatures must be turned in to the secretary of state’s office by May 3. “There are lots and lots of petitions still out there,” Czarnik said. The amendment, which is identical to Republican-backed legislation that stalled in a Senate committee last week, would create a commission, appointed by legislative leaders, to draw the map. The Democrats' plan allows legislators the first shot at creating voter districts. Backers of the citizens' initiative say letting lawmakers draw the map is a conflict of interest, while Democrats say the so-called Fair Map Amendment, supported by Republicans, does not do enough to protect minority populations. Czarnik said that if the effort fails, it might be because of a lack of volunteers and time. “It’s two weeks before we have to file, and if we do fall short, it’s only because we haven’t had enough people circulating petitions in such a short period of time. We are having absolutely no trouble getting people to sign the petitions,” she said. If enough voters sign the petitions, the Illinois State Board of Elections and local election officials would then have to verify the signatures. Supporters of the amendment expect legal challenges to the validity of the signatures, as well as to the constitutionality of the proposal. The judge for former Gov. Rod Blagojevich's corruption case released a document outlining the prosecution's evidence today, despite objections from Blagojevich's lawyers that it could taint the potential jury pool. U.S. District Judge James Zagel ordered the release of the document, which expands upon the original federal indictment. “There is nothing new. It’s the same old false allegations and lies. I’m looking forward to trial so the truth comes out and everyone will see that I am innocent," Blagojevich said in a written statement. A constitutional amendment that would change the way Illinois draws its legislative districts passed in the Senate today with only Democratic support. The legislative leaders from the House and Senate would be charged with naming a 10-member committee for their respective chambers. These commissions, which would presumably consist of five Democrats and five Republicans each, would hold hearings throughout the state to take input and inform the public. However, the General Assembly would have the first shot at drawing the voter districts. A map that includes both chambers could pass just like any other bill and then go to the governor’s desk. If that doesn’t happen by June 20 of the year after the census, each chamber could draw its own map through a resolution, which requires a three-fifths majority vote but doesn’t have to be signed by the governor. If the legislature cannot agree on a map or maps, the redraw would fall to the commissions. Each commission would approve a map for its respective chamber. Six members out of the 10 would have to agree. If the commissions cannot pass a map, the senior Illinois Supreme Court justices from each party would appoint special masters to do the job. If they do not choose maps by October 5, the task would go back to the General Assembly. The act also contains protection for minority populations that exceed those in the federal Voting Rights Act. Republicans argued that any plan that allows the legislature to draw its own districts is not a step in the right direction. A Senate committee voted down a Republican plan, backed by several reform groups, earlier this week. “The people have made it very clear with increasing volume that they don’t trust the Springfield leaders,” said Sen. Matt Murphy, a Palatine Republican. Murphy said both parties have come together recently to pass positive changes, such as pension reform. However, he compared the legislative process surrounding redistricting to the partisan fight over reform that took place last year. That battle resulted in Democrats passing a plan that was opposed by many of the same organizations that are against this amendment. “This redistricting proposal, like so-called campaign reform last year before it, is a cynical ploy to convince the people that real reform has arrived, while all that was really achieved is the continued consolidation of power in the hands of the few. This is a blatant incumbent protection plan,” he said. Chicago Democrat Sen. Kwame Raoul, sponsor of the amendment, said that many of his Republican critics approved the last map that they are now saying was cut through backroom deals. “The congressional map that people refer to that shows the gerrymandered districts was a map that was sponsored by you, not me. Had I been there, I would have voted against it. … I chose the people over the legislative leaders. The people would choose who would draw the map under this scenario, not the legislative leaders,” he said. The amendment now goes over to the House. Speaker Michael Madigan has not said whether he supports it. However, he backed a similar plan that passed in that chamber in 2008. The measure has to pass by May 1 in order to appear on the ballot next November. If it does not or if voters reject it, the current plan would stay in place. Gov. Pat Quinn today signed pension reform legislation expected to provide $400 million in budget relief for next year and reduce the 2045 liability by $220 billion, according to the governor’s office. Under the new law, teachers and state workers hired after January 1, 2011, will be required to work at least 10 years before they can retire at age 67, up from eight years at age 60, before they can collect full benefits. New employees will receive a lower cost-of-living adjustment, and the law will also lower the cap on earnings that can accrue benefits,. The new cap will be $106,800, down from $240,000. Quinn’s original budget proposal for Fiscal Year 2011 assumed $300 million in immediate pension reform savings to help ease the $13 billion budget gap, but he said today he would be comfortable aligning the budget to $400 million in savings, the amount he says has been conservatively estimated by actuaries. While the governor’s office said the reforms will result in future payment savings of $67 billion through 2045, the reforms don’t apply to current employees or help diminish the amount currently owed to those employees’ systems. The year 2045 is significant because that’s when, by law, pension liability funding must be at least 90 percent funded. In 1995, to make up for skipped or inadequate pension payments, the legislature devised a payment system that forced the state to make larger and larger payments for each of 15 years, followed by 35 more years of payments at a level rate. But over the years, lawmakers have opted to continue to push payments off, creating even larger obligations in future years. “This is really a good first step in setting our state finances on the right track,” said Senate Minority Leader Christine Radogno, a Lemont Republican. She added, “I think we can still do some more with pension reform.” She said the state owes it to its residents to find out whether pension reforms can be applied to current employees’ benefits. However, Quinn, Senate President John Cullerton and the Illinois State Bar Association agree that changes to current employee benefits would be unconstitutional. While the Senate Democrats’ proposed constitutional amendment may not be perfect reform, some who have tackled the issue of redistricting before say it could be the most politically viable option. The Senate's Redistricting Committee heard about three hours of testimony on the Republican proposal last night. Multiple reform groups spoke out in favor of the so-called Fair Map plan, but no witnesses testified explicitly in favor of the Democrat’s plan, which passed on partisan lines. The biggest point of contention was, of course, who gets to draw the new legislative map after the results of the 2010 census come in. “We’re not asking for perfection. We just think we can do a whole lot better for the people of the state of Illinois,” McMillan. The Republican amendment, as well as the identical voter’s initiative spearheaded by the League of Women Voters, calls for a commission named by the legislative leaders to draw the map. The eight-member group would vote to pick a ninth member who would likely cast the tie-breaking vote. Members could not be legislators or lobbyists for four years before the plan or 10 years after to avoid involvement from anyone who could benefit from the map. The Democrat plan, known as the Citizen’s First Amendment, lets the legislature get a shot at drawing the map, and if lawmakers cannot agree, it next moves on to a commission. Both plans call for open hearings, and both parties say they want to encourage input from the public. Both plans also eliminate the luck-of the-draw provision currently in place. The framers of the 1970 Illinois Constitution put in a last resort for redistricting if an agreement cannot be reached. Two names are put forth by the legislative leaders, and one is randomly selected. Currently the method is the secretary of state drawing a name out of an Abraham Lincoln stovepipe hat. The winner gets to cast the tie-breaking and presumably partisan vote. The convention delegates thought that no party would want to risk that winner-take-all situation, so it would force compromise. However, it had the opposite effect and that method for drawing the district map has been used more often than not since its creation. “Anything is better than a hand inside the Lincoln hat,” said Andy Shaw, executive director of the Better Government Association. Mike Lawrence and John Jackson, who worked on a redistricting plan for the Paul Simon Public Policy Institute under initiatives that passed in the House in 2008, agree that the random drawing is the biggest problem with the current system. “We saw a need, and we thought that the current constitutional requirement of the random tie breaker was just not working because of course we had three straight decades of it not working,” said Jackson, a political scientist and visiting professor at the institute. “You always are caught on the horns of the dilemma of needing change, and how much change can you get before the thing collapses on itself. And we stopped short of the mark where we thought the thing would collapse politically,” he added. Lawrence said the current Republican plan “represents significant reform.” However, he said a commission selected by the leaders to draw the map would not completely remove political considerations or legislative influence from the process, either. Shaw said it is important to consider the impression that the public has of redistricting. He called on lawmakers to try the Republican plan for the next map, pointing out that they could go back to the drawing board if the plan proves to be too flawed to use again in 10 years. “[Legislators], collectively as a profession, have lost the faith of the people,” he said. Lawrence agrees that the people of Illinois have an important role to play. Lawmakers in the coming weeks will work to tweak legislation that would revamp a 25-year-old law, last updated in 2001, that regulates part of the rapidly evolving telecommunications industry. While consumer groups urge caution, most of the telecommunications industry and business sector call the rewrite a jobs creation measure. HB 6425 would modernize Illinois’ Telecommunications Act and provide opportunities for investment both from the industry and businesses that rely on high-tech telecommunications, proponents of a rewrite say. And more investment means more jobs and more revenue for the state. Paul La Schiazza, president of AT&T of Illinois, one of the major forces behind the call for a rewrite, said that 20 of the 22 states the company serves have already updated their telecommunications laws and that Illinois should do the same. “[The 1985 law] focused, rightfully so at the time, on opening up markets to competition. It focused on breaking vestiges of a monopoly and providing choice to consumers,” La Schiazza said, adding that it was then “the most forward-thinking” telecommunications law in the nation. But the world of telecommunications has changed dramatically since then, and competition is now robust, La Schiazza said. He cited AT&T’s decreased market share – from more than 91 percent in 2000 to its current share of 48 percent – in wire line phone service. Its share of emerging technology services is even lower, La Schiazza said. But AARP Illinois says AT&T’s share of basic telecommunications services, those that the elderly and low-income populations are more reliant on than others, is still highly noncompetitive, and some areas only have a choice between the standard local telephone service and a cable service. AT&T representatives said the Illinois Commerce Commission has twice declared the company’s landline services competitive. But AARP’s Mary Patton said the rewrite proposal’s definition of competitive – important because the state applies price protection measures where competition does not exist – sets the bar too low. She said the bill would reduce the authority of the Illinois Commerce Commission, which currently regulates basic telecommunications services, and eliminate some reporting requirements she feels are necessary because telecommunications is one of the most complained-about services to consumer advocacy groups. “The level of regulation and consumer protection must be appropriate to the actual level of competition in the market, including appropriate consumer protection to address … insufficient competition,” Patton said. Continued maintenance of payphone networks which emergency responders often rely upon. Guarantees that a rewrite will actually result in increased investment, or jobs, in Illinois. Gov. Pat Quinn named Rep. Julie Hamos, a Wilmette Democrat, to head the Department of Healthcare and Family Services. Hamos will replace former director Barry Maram, appointed by former Gov. Rod Balgojevich in 2003, who resigned last week. Hamos has served in the House since 1999, where she has focused on healthcare and social service issues. She lost her bid for Congress in the Democratic primary last February. “I want to make sure we have a person in that department like Julie Hamos, who really cares for families, cares about healthcare understands it’s important that we work with Washington, the federal government, all the time,” Quinn said at a Chicago press conference. Quinn added that communication with the feds will be even more important now that President Barack Obama signed national health care reform into law. Hamos said she is eager to implement the changes in Illinois. “This is an exciting time in the nation's history when we have an opportunity to really make a difference in peoples' lives. With the national health care reform now the law of the land, we will showcase Illinois as the place where we will get it right, and I am excited about building the system from scratch,” Hamos said in Chicago. She also said that she is open to Republican suggestions for Medicaid reform, such as moving some patients to managed care programs. A Senate committee will take up several redistricting plans tomorrow evening. So check back for an update. A hearing on a possible revamp of telecommunications regulation is scheduled for Tuesday. Quinn said budget talks with legislators would begin next week. “It’s time to step on the gas pedal,” he said in regards to the budget. Adjournment is scheduled for the relatively early date of May 2, and lawmakers will be motivated to hit the campaign trail for the November general election. So once the legislature returns from spring break next week, they should be moving bills and budget negotiations along at a pretty quick pace. Check here for updates and analysis.